in partnership with Bolton College. We were delighted to welcome Nathan and his creative ambitions to the CRE8 team. Earlier this year, Nathan was delighted (and probably quite relieved) to complete his apprenticeship! Nathan – 2 years on! During his apprenticeship, Nathan spent time at Bolton College with his tutor but spent the majority of his time in the office with us, supporting his learning with real work on client projects. Nathan got stuck in from his very first day on work experience, and throughout the last couple of years he’s had the opportunity to gain in experience, from essential graphic design skills through to office and business skills that will set him up in his career. 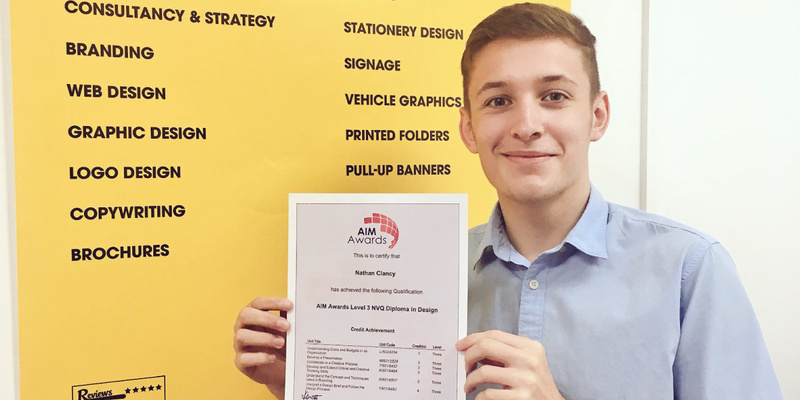 After passing his apprenticeship, Nathan has joined the team permanently as our Junior Graphic Designer, producing quality design for our range of clients, and for CRE8! We asked Nathan to say a few words about his time at CRE8. He struggled to keep it short! Congratulations on completing your apprenticeship Nathan!